The Executive Express Lunch is available every weekday for lunch, and the Executive Chef Noronha and Chef Sankar make sure that the menu is changed every day providing variety to regular customers. 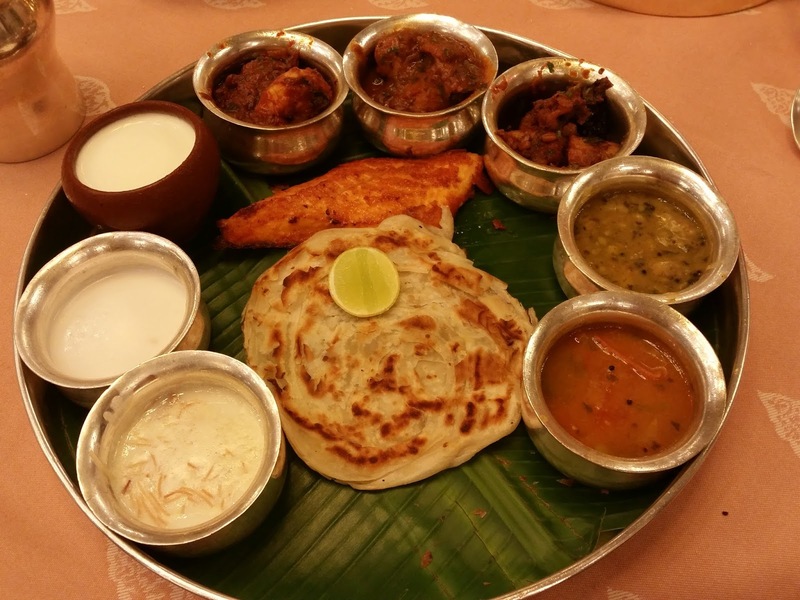 The fare incorporates delicacies from all five South Indian states. There is a live counter called Iyer’s Trolley which prepares delicious appams, banana flavored dosas, paniyarams, and uthapams to be served hot on your plate. Invited to try out the set lunch, I could not but appreciate the décor –with large paintings adorning the walls, the bell shaped ceiling lights and the exquisite brass tableware. 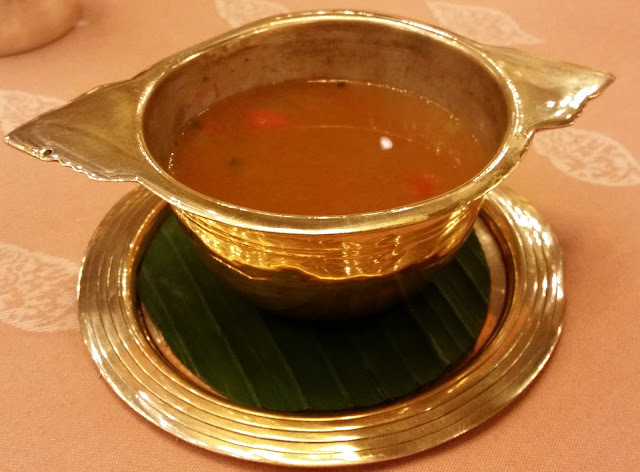 I started with a hot bowl of Melugu (pepper) Rasam, which was tangy and flavourful. 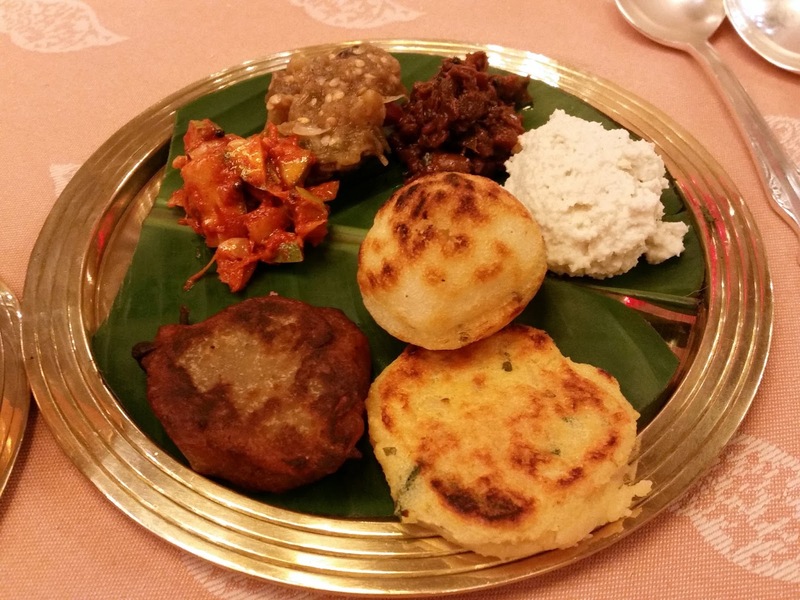 This was followed by a set of starters – the highlight of which were the Paniyaram and the Masala Vada. The latter went famously with an awesome Vankai Gochu or brinjal chutney served with it. The paniyaram had some delightful coconut chutney as its foil. Raw mango with garlic chutney and Tamarind Chutney were the other chutneys in the platter. The assortment of chutneys had been planned in such a way, that the taste of each was distinctly different. The Express lunch has three versions – Vegetarian, non-vegetarian and seafood. 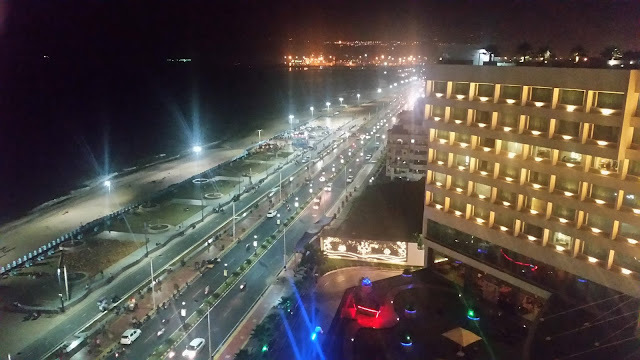 I asked for a seafood version and within ten minutes a thali brimming with delicacies was on my table. The thali had a limited number of vegetarian items too- the Andhra style Pappu and Murugunkai (drumstick) sambar were the first two. The highlight here was the Urlai Roast – a baby potato preparation with onions and spices. The coconut milk served in the thali was perhaps to be enjoyed with an appam – but I loved the taste of it as it is. There were three non-veg preparations in the thali - Royyala Iguru, Kodi Koora and Chapa Vepudu. The fish in the vepudu was big piece of soft murrel fried to the optimum texture with the marination having a distinct touch of garlic and lemon. A hot appam from Iyer’s Trolley was soon devoured with the Andhra style chicken curry, which unlike to its reputation was not fiery hot but rich in both color and flavour. And finally, a Tamil special Veechu Parota (where dough is rolled out and then folded) was tried out with the iguru, which had spicy and delightful masala sticking to the large prawn pieces. Next I tried, their Prawn Pulav, an Andhra preparation with a delicate combination of spices. None of the Andhra preparations in the thali had an overdose of chillies, making it very palatable for people from other parts of the country. A South Indian meal is never complete without rice, ghee and podi, but I used part of that rice to polish off the remaining Prawn Iguru. One needs to mention about the special packaged water which I tried out with the lunch. ŚūnyAqua (or Shunya (zero) aqua) is a special herb-infused water which is bottled inside each ITC hotel. The variant I tried was infused with Fennel and Cinnamon, whereas there is another variant with Tulsi or basil. 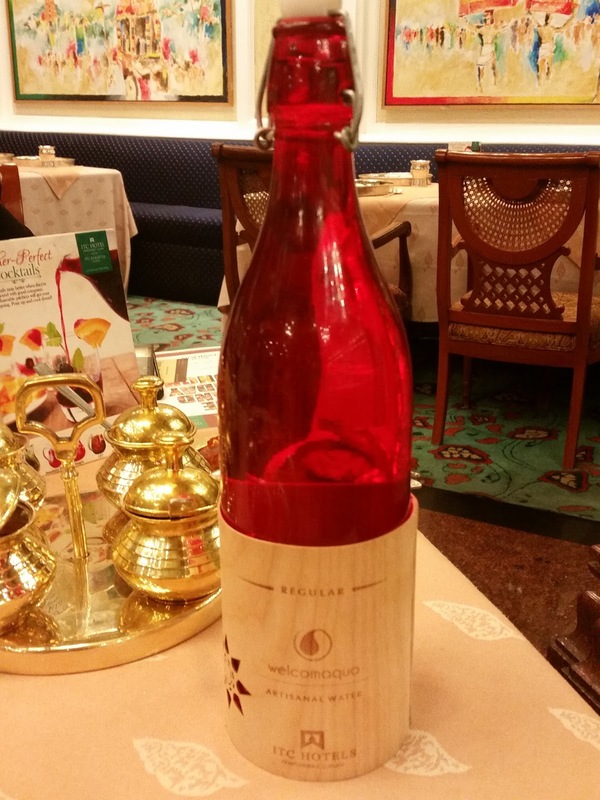 This is available as an add-on to any meal here, as a healthy option to the usual packaged water. The desserts in the thali were Semiya Payasam and curd. Chef Noronha specially got some Badam Halwa from the kitchen – which had badam mashed and soaked in ghee. The halwa was very heavy but delicious. 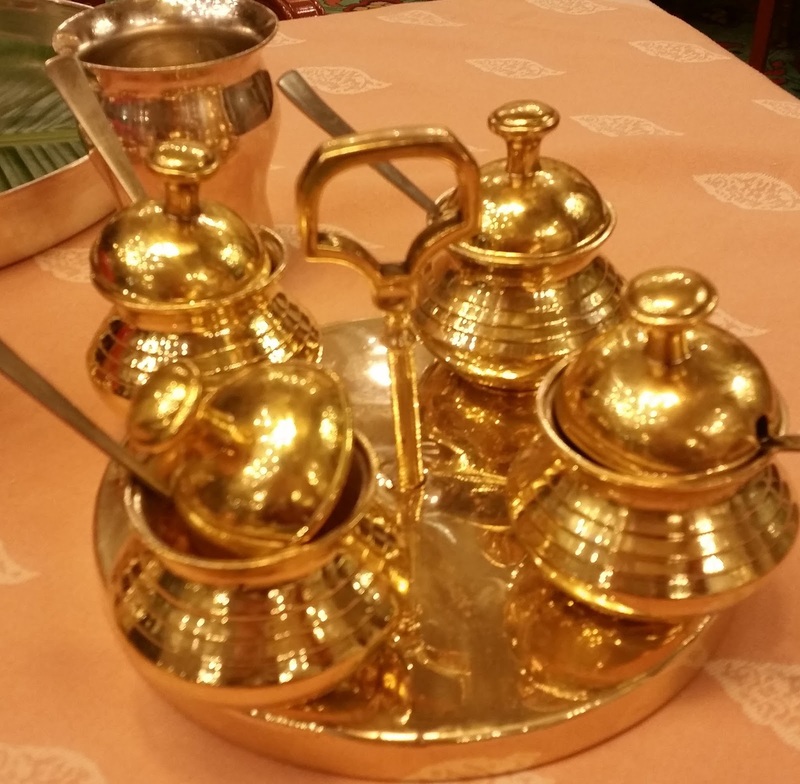 The meal ended with a signature Dakshin coffee – the Tamil Nadu style filter kapi served in the traditional way. 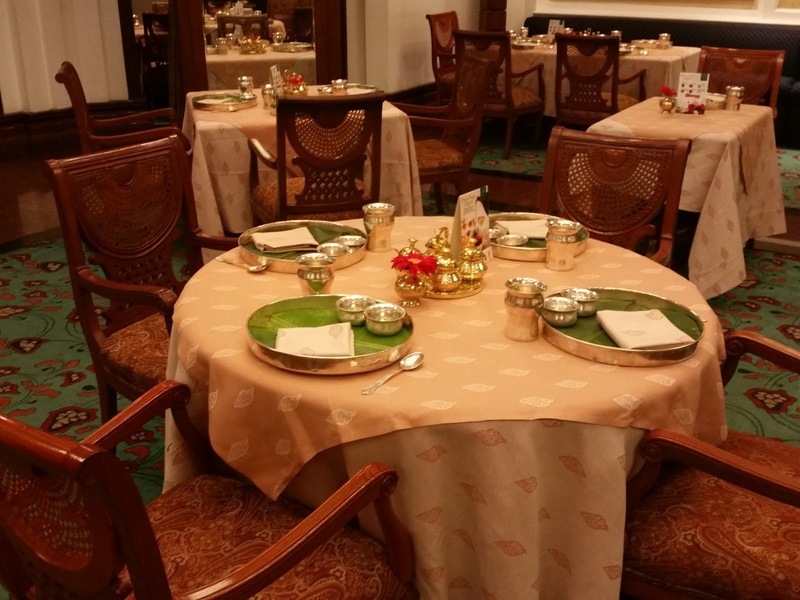 Overall, the Dakshin Express Lunch is a great option to catch for a quick but delightful fare of South Indian traditional food. 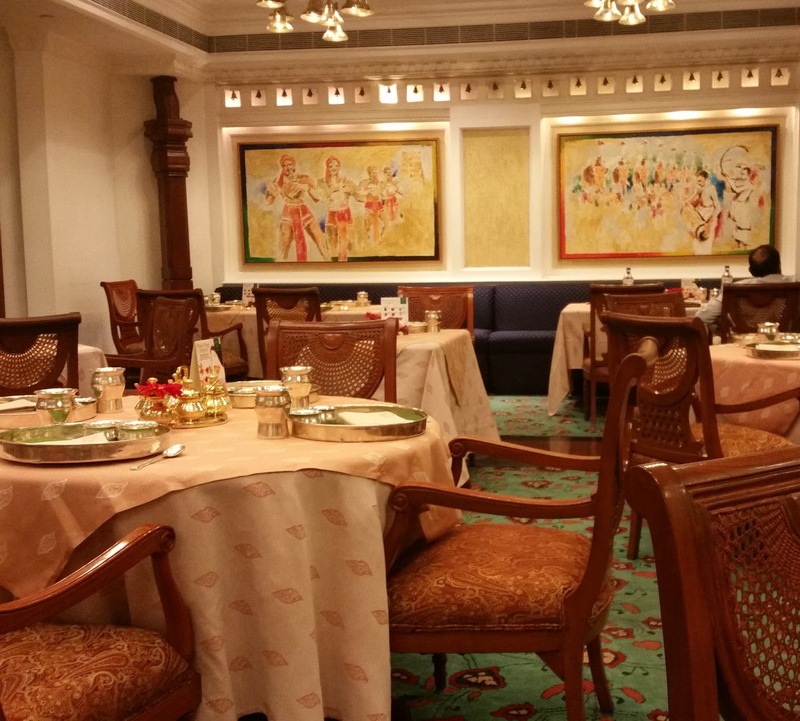 Whereas it may be a good option for busy executives, it may also serve as an introduction to the varieties of South Indian cuisines for a person visiting Hyderabad. The Dakshin Express Lunch is available Monday to Friday. There are three variations of the thali – vegetarian, non-veg and seafood, and prices range from Rs 1200- Rs 1800.
wow.. this looks to be one royal feast!